I found this little gem under the tree on Christmas morning. (Thanks, hubby!) 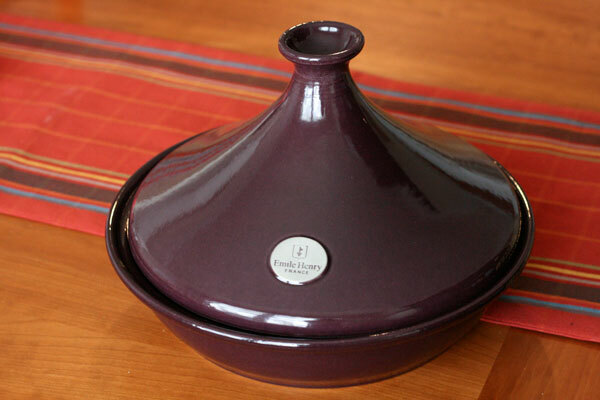 It’s a tagine, a special pot designed to prepare Moroccan dishes. As you can see, the base is shallow and circular, and the large cone top keeps food moist while cooking by returning condensation that rises back to the bottom. Tagine is also the term for the food that comes out of it — typically slow-cooked, tender, moist, and aromatic stews. 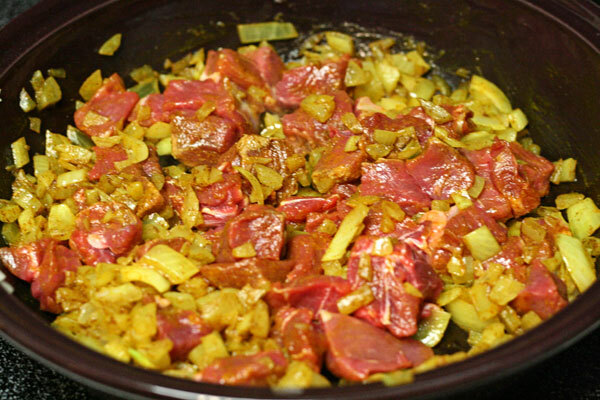 The most common ingredients include lamb, preserved lemons, olives, honey, cinnamon, saffron, and ginger. So what did we make for our tagine’s inaugural use? 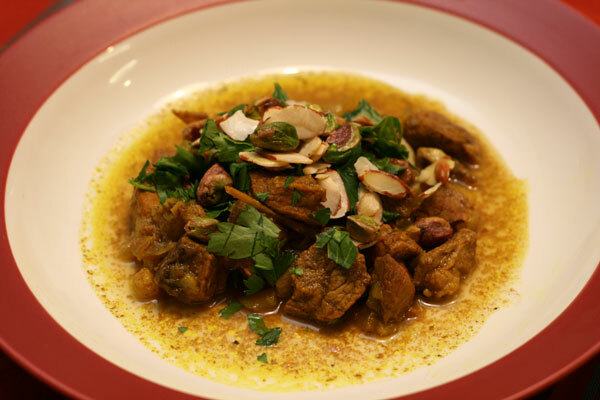 A traditional dish of lamb, dates, almonds, and pistachios. First we sautéed the onions with tumeric, ginger, and cinnamon. Then we added the meat. It already looks exotic, doesn’t it? We added enough water to cover the meat, brought it to a boil, then reduced the heat, covered it, and simmered it for 1 1/2 hours. The smell filled our kitchen and living room, and I believe it even floated up to our second floor. It’s impossible to keep a smell like this contained. After the first round of cooking was complete, we added the dates and honey and salt and pepper and simmered for an additional 30 minutes. Meanwhile, we browned the nuts with some butter and olive oil. When the lamb was tender and the dates were soft, we scooped it in our plates. A sprinkle of nuts and a handful of fresh parsley finished it off. Oh. My. Goodness. This was so amazingly flavorful — and I’m not even a big fan of lamb. It was slightly sticky and sweet. The meat just melted in our mouths, and the nuts added a good crunch. I recommend it, even if you don’t own a tagine. You can simply substitute a Dutch oven or large, shallow stock pot. So what else do we have planned for our new cooking vessel? (Besides looking all lovely perched upon our hutch.) Spicy meatballs with cinnamon, cumin, and coriander.. Chicken with apricots, rosemary, and ginger. Butternut squash with shallots, raisins, and almonds. The possibilities are endless. Have you ever cooked with a tagine? Heat 1 Tbsp olive oil and 1 Tbsp butter in tagine (or Dutch oven). Add onions and sauté until golden. Add tumeric, ginger, and cinnamon. Add lamb and toss to coat. Pour in enough water to almost cover meat, and bring it to a boil. Reduce heat, cover with lid, and simmer gently for 1 1/2 hours. Add dates and stir in honey. Cover with lid again and simmer for another 30 minutes. Season with salt and pepper. Heat 2 Tbsp olive oil and 1 Tbsp butter in small sauté pan. 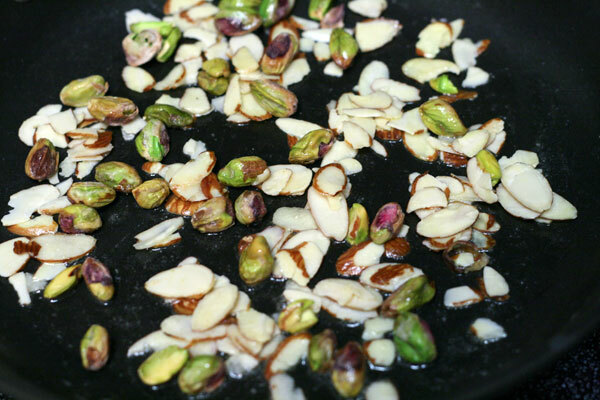 Stir in almonds and pistachios; cook until golden brown. Scatter nuts over tagine and sprinkle with parsley. Serve with rice or couscous. Ooooh, I love it! So pretty! Just got yummy looking lamb steaks on a trip to Stew Leonards — this looks like just the recipe to use on them! Love your tagine. Such a pretty color! We just had this for dinner and it was soooo yummy! Love the unusual blend of flavors (and it looked so pretty when served)! I used pork instead of lamb and made it in my electric skillet. Can’t wait to try it for company! Thanks for the great recipe! I’m glad I found this in a web search! 🙂 I had the book you adapted this from and can’t find it and wanted to make this for dinner tonight. One suggestion: instead of the oil + butter combo, get yourself a jar of ghee and use that instead. You will never use anything else to saute with again. It adds a whole new dimension to the dish.